Today's lesson from the garden is about "things that sting". The first thing that stings is a paper wasp. If you look closely at this picture of my bunny bell, you will see a paper wasp at the bottom of the picture. He's looking for his nest or hive or whatever they call the place they form to lay all their eggs. 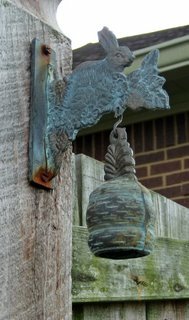 It used to be inside that bell. However, one of the paper wasps ruined it for everyone else by STINGING me on the shoulder as I passed by. They chose the wrong gardener to sting! I sprayed them down with some wasp/hornet killer, and wiped out the eggs. All gone! Prior to this weekend, I can remember only being stung twice in all my years of gardening. I don't think I'm that old, but if you go back to my start in gardening as a wee toddler, we are talking four decades. Just two stings. Then this weekend, I was stung four times. I think the paper wasps are pretty aggressive this year, or they've just decided my yard is the place to be. I destroyed one other nest with eggs. It was under the arm of a chair I moved to get to a weed growing up through the patio pavers. I could not find the third hive, but I sprayed where I thought it was. Okay, now that you've mastered the first lesson about paper wasps, let's move on. The second thing that stings is a weed called Stinging Nettle. This is a picture of Dead Nettle, Lamium maculatum "Aureum". It is called dead nettle because it does not sting you. 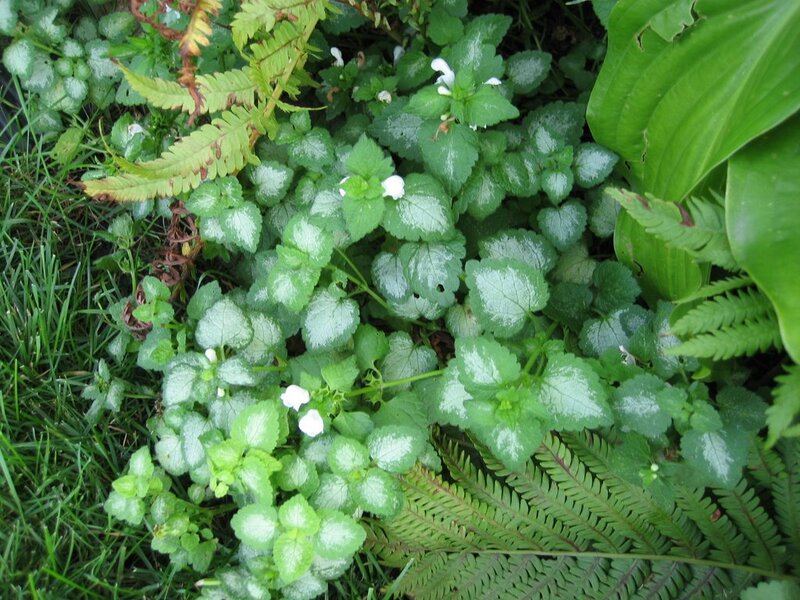 It's generally used as a ground cover in shady areas. Stinging Nettle is called stinging nettle because it stings you when you touch it. 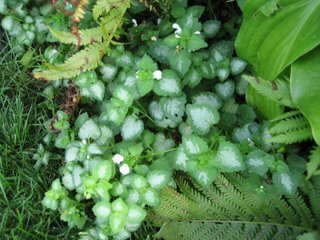 I was doing some weeding and saw some Stinging Nettle (probably Urtica dioica) growing in one of the containers on the patio. I thought "that's stinging nettle, be careful". And I was careful when I pulled it and I threw it in the bushel basket with the other weeds I had pulled. The basket was nearly full, and that stinging nettle landed on the top of the heap, so when I picked up the basket, my forearm brushed across the stinging nettle. "Ouch, that stings", I thought, "I need to go inside and wash that off to stop the stinging, but first let me move this chair..." and then I didn't notice so much that my forearm was stinging, because the first paper wasp stung me right then! My antidote for the paper wasps stings is to apply a baking soda paste and rest for a few minutes. For the stinging nettle, I just wash that area of my skin that came in contact with the plant and the stinging goes away, eventually. So, to complete today's lesson, just keep in mind "know what Stinging Nettle looks like, or don't touch your weeds"! OK. Now why wouldn't bunnies think they are welcome in your garden when you hang such a cute bunny decoration on your gate? I bet if you gave that to your youngest sister, all your bunny problems would go away! LOL! Hopefully you didn't do what I did a year or so ago. That boxwood by the driveway had a hive in it. so I sprayed killer stuff on it. I sprayed so much (had to be sure I got them all) that I killed the center of the plant. Lucky you aren't allergic to them. You might be careful next time. Luckily, I didn't have to spray any plants to kill the yellow jackets. Over here some people harvest stinging nettles when they're young and make a tea / veg dish from them. Food for free I know but I've never been tempted!